Sometimes change happens gradually, with scattered milestones that only stand out when observed in retrospect. But sometimes, we encounter a milestone so significant, it stands out immediately. And today, I’m excited to share one of those milestones. We’re experiencing online marketplaces evolve faster than ever before. Last month, Apple announced it will begin selling direct to consumers on Amazon’s marketplace – a big step toward improved customer service (especially since Apple customers buying on Amazon benefit from free two-day shipping with Amazon Prime and never before seen discounts in the form of Amazon gift cards). Apple’s move follows another super brand’s (Nike) decision to sell direct to consumers on the e-commerce giant back in June. It is clear big brands are seeing the light their customers are shining and following them to the online marketplaces they’re patroning; what is interesting, is how this approach is spilling over into the B2B market, especially in more traditional industries, like logistics. In the logistics industry, we can be proud of the accelerated change of pace – we started with EDI back in the 70s and until recently that was the best technology we had; but, the last three years have shown breakout levels of development across improved digitized customer experiences, with top tier forwarders and carriers providing better tracking tools, better data tools, and, most recently, digital freight sales and freight management tools. This has also had an impact on business models. 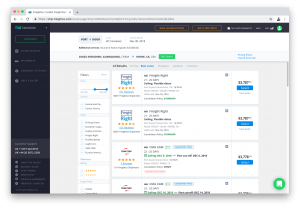 Digital forwarders, integrated carrier offerings, and online sales all represent changes, as does the first experiments of carriers with dynamic real-time pricing via API. Here at Freightos, we’ve had the privilege of accompanying some of the world’s largest logistics service providers on their digitalization journeys. Today I am proud to share that CMA CGM, a top five ocean carrier, made industry history as the first ocean carrier to sell direct to shippers on freightos.com. CMA CGM isn’t just focused on surviving the digital revolution; they are committed to being digital leaders who will thrive in the logistics industry of tomorrow. With this move, ocean shippers of all sizes now have direct access to instant pricing, routing, and concrete sailing information in seconds. They also have guaranteed capacity – believe it or not this is the very first time that guaranteed slots and guaranteed prices are offered publicly on major trade lanes. With CMA CGM on Freightos, shippers and carriers finally have a straightforward two way commitment- the carrier guarantees the slot and the shipper promises to pay. This solves two of the industries biggest problems in one stroke – for carriers it solves the cancellation/no-show problem while for shipper it eliminates rolling containers to later sailings. From the beginning Freightos has worked toward our goal of making freight frictionless. This is a lofty ambition and one we can’t achieve in a vacuum. With partners like CMA CGM, we’re taking an active part in the fourth industrial revolution (4IR) and making strides toward a seamless, efficient freight experience for all stakeholders. Yes, carriers selling online are a challenge to traditional freight forwarders. Of course ocean carriers have always sold directly to shippers, but in the past mainly to big shippers. Now with open digital platforms like Freightos, a carrier can sell a single slot to a small shipper . But this is how industries evolve, not only is it inevitable change that will help make the industry more efficient, this new carrier phenomenon will also prove to be an opportunity for freight forwarders too. Freight is not just about moving goods from port to port. Goods need to move door to door. They need to sail through export and import customs. In some cases value added services are needed. If NVOCCs are simply making their money by marking up the ocean leg, their business model is under threat. But if they are providing great end-to-end service, and if their back office is highly digitized, their business model will thrive in the digital future. Freightos is proud to partner with over 1,000 freight forwarders helping their digitization road-map. Forwarders and carriers both have the equal opportunity to hone the level of service they provide, not just in terms of customer relationships but in terms of the technology, reliability, and pricing that they provide. We are moving towards a more transparent future. Transparency is a great thing for those who provide the best service at the lower cost. And I, for one, am excited about where this will take us.